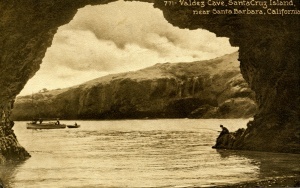 Cueva Valdez, Santa Cruz Island (Valdez Cave, Quava Valdez, Tres Bocas, Valdez Anchorage, Valdez Harbor) is located on the north side of the island, well to the west of Lady’s Harbor. 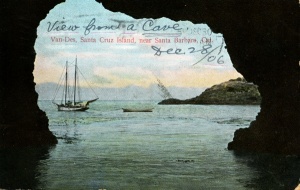 The place name C. Valdaze appears on the June 1882 U.S. Coast Survey map Pacific Coast from Santa Monica to Point Conception, including the Santa Barbara Channel, California, J.E. 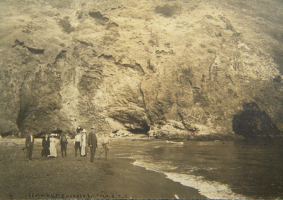 Hilgard, Superintendent. 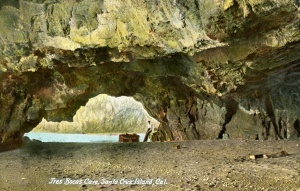 Cueva Valdez was a favorite anchorage and camping location during the first few decades of the 20th century, and several artists, including Edward Borein, Lockwood deForest and Alexander Harmer camped and painted here. 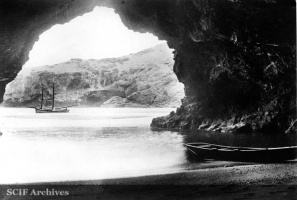 Its main attraction is its large, three-entranced cave which can be entered from both the beach as well as from the water. 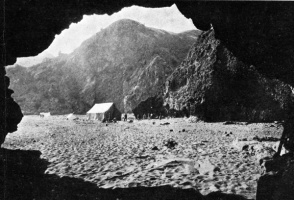 During the formative years of the film industry, movie companies found this location ideal for filming. 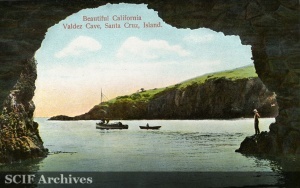 This place name appears incorrectly as Cueva Valdaze on the Santa Cruz Island Sheet B topographic map. 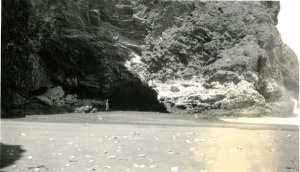 When the island was partitioned in 1925, this location was included in Tract No. 3 appointed to Delphine A. Caire. 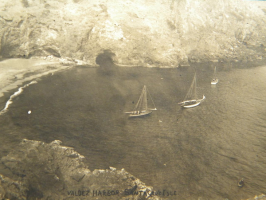 Vessels wrecked in Valdez Harbor include Irene (1907). 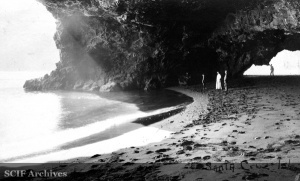 » Poe, David and Craig Willis Cueva Valdez in Santana (4-6) October 1987. 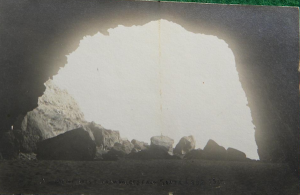 In January, 1907, the engine of Ira Eaton’s boat Irene quit during a northwester at Valdez Harbor, and she was smashed against the rocks. 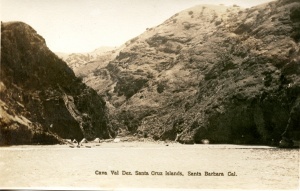 April 25, 1916 [SBMP]: “Three get lost on Santa Cruz Island...” Three campers at Fry’s Harbor were lost on the island for three days and nights after loosing their way back to camp from the Christy Ranch. 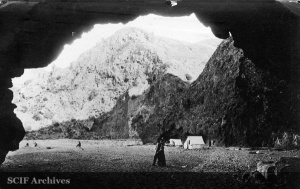 They were found by Ira Eaton on a cliff three miles above Cueva Valdez “fatigued almost to the point of utter exhaustion,” suffering from hunger, thirst and exposure. 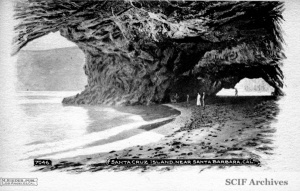 July 22, 1924 tragedy struck a very large camping party when three people from Santa Barbara, Mary Stewart Wilkinson, Milton Stewart, and Dr. Hal Bishop were drowned in a skiff accident in heavy wind and seas. 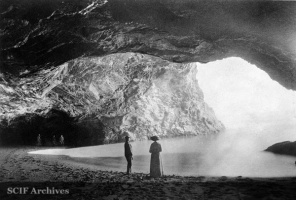 Famed western artist Edward Borein and his wife were on that particular trip. 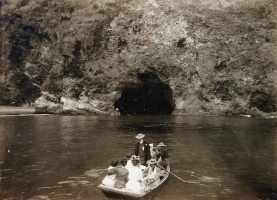 July 1930 Santa Barbara Museum of Natural History director Ralph Hoffmann wrote: “The third night was spent in Valdez Harbor on Santa Cruz, outside the cave where the barn swallows twitter by day and petrels call by night. 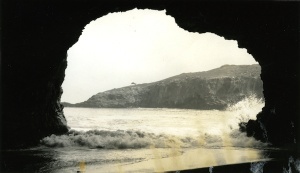 This page was last edited on 12 September 2018, at 18:23.